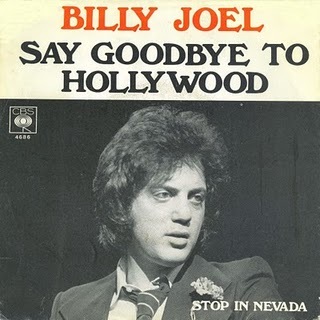 Let me first tell you that I'm not a Billy Joel fan, but as a little kid I was! Growing up on Long Island, at some point in your life you have to like Billy Joel. Why? Because Billy is Long Island. I know I've blogged about my roller skating rink days at Hot Skates in Lynbrook, Long Island several times... But seriously, in the early 1980s when this song came on, it was like everything was right with the world. Why? Three little words. Couples. Only. Skate. I'd grab the hand of an unsuspecting fellow fifth grader and off we'd skate into the night for an entire 4 minutes and 37 seconds to this particular Billy Joel song you can hear below. Even if my skating partner wasn't particularly cute or stylish; the music, the lights, the glimmer of the disco ball, made him seem almost as cute as Jason Bateman on Little House. It was heavenly. Please, don't go yet! You have to watch this! You have to see this commercial! It's for the skating rink I blog about constantly and it's actually from around the year I spent the most time there, 1984. Check out the girl's accent. A true Long Island girl! One of my many Hot Skates birthday parties. 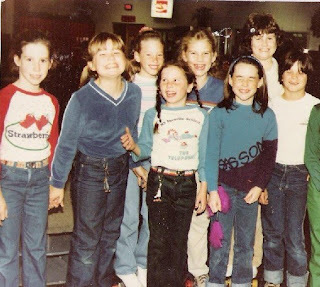 I'm with the big grin, bangs and blue velour shirt. Jason Bateman was on Little House? Why are roller skating rinks going extinct? They were so fun back in the day. My kids did an exhibition type commercial for one of our rinks. I don't think it ever aired. Don't like BJ? Man, you'd really have your Lon Giland membership revoked if you wrote that again. BTW...interesting bit of trivia about the skate commercial. The awkward brunette in the ad is the legendary Debra Winger. I know, right, I was shocked as you all. "What ah you doin' tonight?" Uh, stalking boys at the skating rink in a very non-creepy way just like your commercial suggests I do! Ah! I love this post and that commercial! Cheese- yes Jason was on Little House. He was so adorable too! He played James. Roller rinks made a comeback because of in-line skating a while back. Copyboy, I don't think you like BJ either - too Long Island for you, no? That commercial is priceless. I grew up in small towns so never really had any local commercials. That rink certainly looked like the place to be! My best friend from Brooklyn knew Billy, or "Williams" when they were just starting as musicians. I forget the names of the bands, but whatever lol great story, I used to go skating too!! Sadly, my childhood roller rink is now closed. It was literally my favorite place on Earth - MonroeBowl. I was the roller-limbo queen, and I had red, white & blue skates. Good times. I was only at a roller skating rink once for a part of a birthday party in either 1981 or 1982. I didn't skate much because I was afraid to- bad memories of braking my arm while doing so in 1980. I like Billy Joel but not as much as I used to. I have to be in the mood for hearing him- certain songs do annoy me though. Glass Houses is my favourite album of his. Oh, my GAWD! I loved roller skating and the highlight of my life, the couples skate. I got my first kiss at the skating rink from the boy I was certain was the love of my life. He wasn't, thank the Good Lord, since the last time I saw him at a reunion, he was unemployed and "just trying to live life in nature." I'm pretty sure those were his code words for homeless. So, I guess that means my first kiss came from a homeless guy. And that's the wonderful thing about roller skating rinks. Jason Bateman is hotter now than then. Maybe cuz I'm old. Oh, this post was about Billy Joel.... You have the best pics from when you were younger. Love the velour shirt. This makes me want to go skating and grab some unsuspecting boy to skate around the ring with - so long as I'm able to hug the wall. Billy Joel is one of my favorites. It's funny, I remember heading to the skating rink with my cousins growing up…one of the best memories of visits to Clarkston, Washington. Thanks for taking me on your time-travel ride. I loved roller skating in my younger years too! The skating rink is still there and in business. We also have a newer skating rink closer by, but my sons didn't get into skating as much as I did. Billy Joel was the first music tape I ever got and I still love his stuff, even though I'm not from NY. in ugly brown and I hated it. I love the short, "boy hair" on the blonde in the commercial. Not sure why women ever thought they should get haircuts like men. omg, saw u over on Misadventures site... btw i sent u an email not knowing u had just come from his site.. anyway I love the pics u have here..
You have to LOVE the old school skating rink euphoria! I was a skating daydreamer myself and oh how I LOVED the couples skate. Even as an awkward redhead with freckles...I was empowered by the music. Thanks for the flashback and for stopping by my blog. I'm excited for things past, present, and future from your delightful blog. I love the velour shirt! I think I owned one in every color! Oh, the memories! BTW, I found your blog on teachinfourth's. I love his Joey stories! I love your blog! I'm glad you found me, I'm following you back :-) I'm having fun looking around your blog, and I'm looking forward to reading more. Feel free to come visit my blog anytime! Ahhh...the roller rinks.....best places in the world. Best time of my life. Haven't put my skates on now in about 8 years...but I'm itching to. Thanks for triggering the memories. Couples skate really WAS a lot of fun back then. oh good a fellow LIer who doesn't like billy joel! Billy Joel is one of my favorites! Were you guys Huey fans too? I want to go roller skate now!